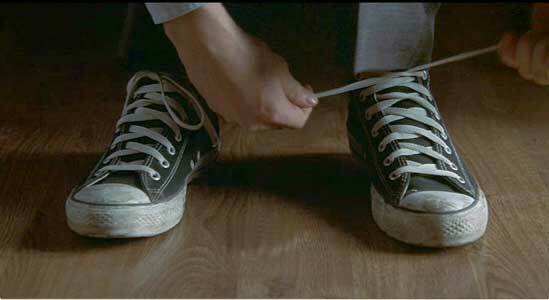 Anton Yelchin wears black high top Converse “Chuck Taylor” All Stars in the film. Charlie’s mother is continually getting him out of trouble. Charlie Bartlett wants to reach out to society. As the film opens Charlie (Anton Yelchin) fantasizes that he is just about to go on stage in front of an audience of thousands of teenagers who will cheer and hang on his every word. Charlie comes from a very wealthy family. Throughout his life he has been sent to the best private schools, but keeps getting expelled for various scams that he pulls. At his latest school, he was expelled for manufacturing a slough of fake identification cards. It seems that Charlie is somehow crying out for attention and acceptance but is not connecting with anyone. On paper Charlie would seem to have everything going for him. He is bright, articulate, and a talented musician. He has plenty of money and a mom (Hope Davis) who ignores Charlie’s faults and continually tries to bail him out of trouble with her checkbook. He is estranged from his father, who is serving a term in prison for tax evasion. After his latest expulsion, Charlie is forced to go to a public school. On his first day, he is wearing a suit and tie, and carrying an attache case, totally unprepared for a day at Western Summit High School, a middling high school with an indifferent administration. He hangs out with the uncool people and students run away when he tries to make contact. Charlie immediately becomes the target of the school bully Murphey Bivens (Tyler Hilton), who dunks him in the toilet in the boys bathroom, and then after school finishes the job by beating him up. Charlie uses his regular visits to various psychiatrists to get medications. Charlie is not one to be brought down by a low life bully. Encouraged by his mom, Charlie’s goes to see a psychiatrist to find out why he not accepted at his new school. The psychiatrist decides to prescribe Ritalin. But Charlie doesn’t have ADD (Attention Deficit Disorder) and isn’t naturally hyper. After taking it for a few days and seeing how crazy it makes him, Charlie comes up with a better idea. Most of the students at Western Summit High School probably have some sort of problem, and he decides to offer them free counseling, and if necessary some drugs to go with the counseling which he has plenty of access to through the various psychiatrists he sees. But there is one more piece to the puzzle. Charlie needs an enforcer to keep order and take care of the business side of things. He gets Murphy Bivens into his limo, and proposes that they become partners. Bivens doesn’t want to cooperate at first, but is eventually persuaded by the promise of money. From day one, Charlie’s counseling service is wildly successful, with students standing in line at the boys bathroom waiting for their turn. The principal of the school, Nathan Gardner (Robert Downey, Jr.) figures that something illegal is going on, but he has no proof that anything is wrong. To make things worse, his rebellious daughter Susan (Kat Dennings), thinks that Charlie is cool, and falls in love with him. Now Charlie has realized his dream. He had become very popular with the student body, has a girl friend, and he is helping people. Charlie gradually gains popularity on campus as their resident “psychiatrist”. Eventually Charlie’s house of cards falls apart. A student overdoses on the drugs that he received, and when the principal confronts Charlie about what happened, he realizes that he needs to give up handing out drugs. Charlie announces to the student body that he is going to do that, but that he would continue to give out advice free of charge. Now Charlie discovers that he has talent as a counselor, because the students continue to line up to see him. At this point the movie changes directions and becomes an adults versus teenagers story, with the school administration becoming repressive against the students and Charlie finds himself stuck in the middle. The remainder of the film deals with these issues and also a conflict of wills subplot between the hard drinking Nathan Gardner, his daughter Susan, and Charlie. Charlie ends up dumping the drug side of his service down the toilet. 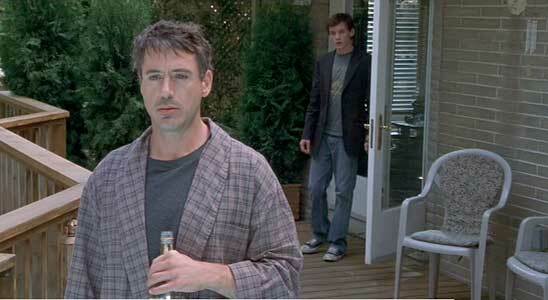 The main problem with Charlie Bartlett as a story is that it tries to have too many stories going on at once instead of concentrating on one or two concepts, like Charlie’s quirky life style and coming of age. It’s too bad that the plot doesn’t live up to its potential. The film has a great cast, led by Anton Yelchin and Robert Downey, Jr. It starts off as a Ferris Bueller type of comedy, but loses its way when the story line starts to get too serious. Instead of giving more of the secondary characters more screen time to interact with Charlie, or fleshing out the quirky satire on our drug-oriented culture and how teenagers are more obsessed with their popularity than actually learning anything, the film cops out by becoming a battle of the generations. The old cliche of school administrators cracking down on the students for no apparent reason is brought into play and all of the clever satire and interesting characters become muddled in an “us versus them” scenario. And then the writers let the film slip away from its most important audience, high school aged teenagers, by acquiring an “R” rating for some unnecessary language and bare breast shots. Anton Yelchin again proves that he is one of our most talented young actors, and he almost makes this movie work. Robert Downey Jr. shows us that he is the actor of the year even with the weak dialogue he has to say as the principal who would rather return to the classroom than be Western Summit High School’s chief disciplinarian and enforcer of the school district rules. Hope Davis is perfect as Charlie’s scatterbrained mother. It’s too bad more wasn’t made of their relationship because the few scenes they have are funny. This is the second film where Davis plays Yelchin’s mother. The other film was Hearts in Atlantis with Anthony Hopkins. Kat Dennings role as Charlie’s girlfriend who happens to be the principal’s daughter is another part that could have been developed more. Less lipstick and more dialogue would have added a lot to our understanding of both Charlie and her father Nathan. Charlie Bartlett is a film that has ambitious goals but gets bogged down in too much convention and sentimentality. If it had been left a crisp satire or comedy it would have worked a lot better. After seeing the film you feel that you were entertained but you are not quite sure what the film was really about. It is an interesting first effort by director Jon Poll and screenwriter Gustin Nash. Mr. Gardiner and Charlie have a meeting to “work things out”. 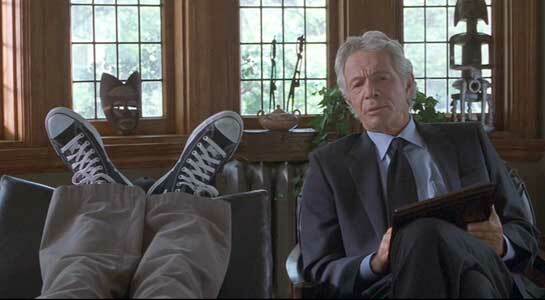 As he does in just about all of his films, Anton Yelchin plays the title role of Charlie Bartlett wearing his favorite sneaker, black high top chucks. Chucks are sort of the equalizer in his outfits of generally very preppy clothes. 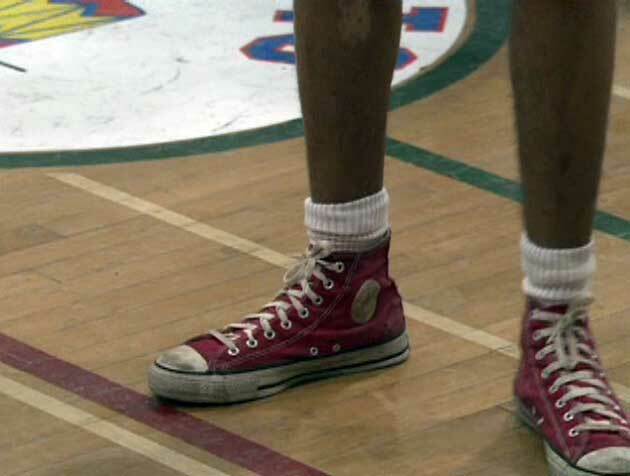 Yelchin really likes black high top chucks, as he is seen wearing them outside the set all the time. 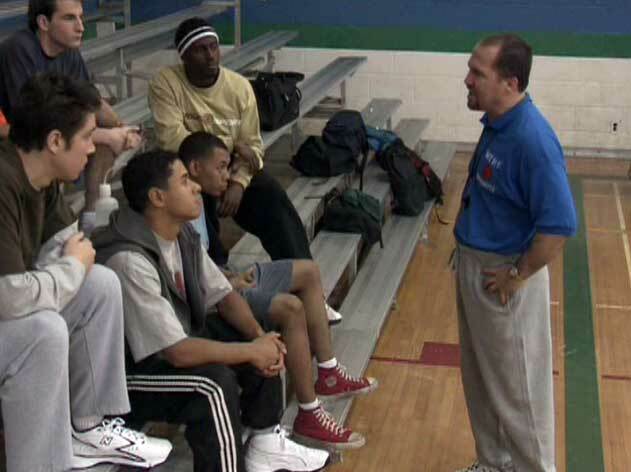 And it seems very appropriate that his character, who is a bit of a renegade, and at the same time very wealthy, would want to wear America’s classic athletic shoe. 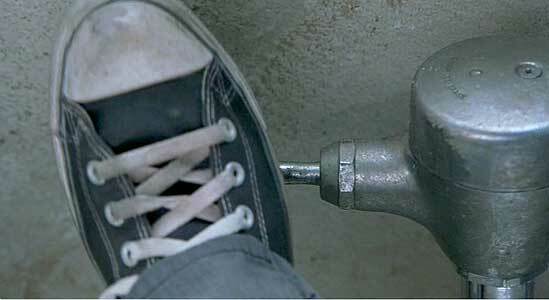 There is great cinematography of them throughout the film, which is why it is so very annoying that some studio wonk decided that they had to white out the Chuck Taylor ankle patch in some of the close-up scenes. Maybe Converse was supposed to pay the producers off or something, but this decision is ludicrous, and an insult to the audience and to Yelchin’s character. There is no way that he would be seen wearing a pair of cheap knock-off sneakers when he could be wearing the real thing. And all of the other close-ups make it crystal clear that he is wearing black high top chucks (definitive shots of the stitching, piping, laces, eyelets and outer soles), even without the ankle patch. So why white it out for a few scenes? (Some of the other scenes actually show the ankle patch, but not in close-up.) Thanks to Photoshop, we have restored the ankle patch to the main shot showing Yelchin wearing his black high top chucks. It looks so much better with the complete shoe. In a way this is an analogy to the overall experience of watching the film: Just when things are getting interesting, the filmmakers drop the ball or do something they really don’t need to. Charlie gets ready to be a “rock star”. Charlie Bartlett. (2007) Anton Yelchin, Hope Davis, Robert Downey, Jr., Kat Dennings,Tyler Hilton, Mark Rendall. Directed by Jon Poll. Categories: Comedy, Drama, Teenagers.